Texas Benefit Services, L.L.P. was among the first in Texas to introduce the Cafeteria Plan (Section 125) and 403(b) Administration to public school districts. We have been a licensed Third Party Administrator since 1990 and offer a complete spectrum of administrative services related to Section 125 (Cafeteria Plan) and 403(b) Administration. 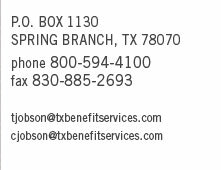 Texas Benefit Services, L.L.P. currently provides cafeteria plan services and/or 403(b) administration to over 10,000 educators across Texas. We are specialists in educator business. We understand the education business and the environment in which educators work. When we administer a 125 plan we endeavor to meet with each individual employee to explain their benefits and answer questions. Texas Benefit Services, L.L.P. does not employ professional enrollers, nor do we just send or drop off forms for the employer or employee to fill out. When we administer a 403(b) program, we ensure that all compliance issues are reviewed before any deduction is allowed. Each district is assigned a representative to permanently service and be available twelve months out of the year to assist where needed. This assignment of responsibility assures that the entire spectrum of service is provided in a professional manner. We look at ourselves as your "partner", in the sense that we try to make the employee benefits part of your job easier. Employee benefits is an increasingly complicated matter requiring professionals. Texas Benefit Servcies L.L.P. will provide those professionals. can be downloaded by clicking here.